Education about the importance of sleep health and effective countermeasures for fatigue should form the basis for any fatigue management plan. Fatigue countermeasures refer to a range of strategies aimed at either minimising or counteracting the effects of fatigue and the dangerous state of drowsiness when driving. It is important to emphasise fatigue countermeasures can only temporarily reduce the risk of a fatigue-related incident, they cannot eliminate the risk. The only cure for fatigue is sleep. So which countermeasures are most effective? Napping is the most natural countermeasure against fatigue and has been shown to reduce many of the performance impairments caused by sleep deprivation, sleep restriction and working long hours. It is important to consider the effects of sleep inertia following waking from naps. Sleep inertia refers to the period of disorientation, grogginess and performance impairment that is experienced immediately upon waking. Consequently, the potential for error and incident during this period is high. The length of time people are affected by sleep inertia can vary from a few minutes to as long as 20 minutes. In an operational environment, time for recovery from sleep inertia following a nap should be taken into account. So how long should I nap for? Short tactical naps of 20-30 minutes in duration can provide measurable increases to alertness and performance that can extend for up to a few hours while also reducing the effects of sleep inertia. Are there any limitations to using napping as a fatigue countermeasure? Caffeine has been shown to be an effective countermeasure to fatigue by temporarily increasing alertness, sustaining wakefulness and delaying sleep onset. Caffeine is available in various forms (coffee, tea, energy drinks, chocolate, over-the-counter tablets, etc) and its strength can vary widely, particularly in coffee. For example, the amount of caffeine in one cup of coffee (about 135mg) is about the same as 2-3 cups of tea or 3-4 cans of regular diet cola. Research has shown that 150-200mg of caffeine (2-3 cups of coffee) is effective for temporarily improving alertness, with benefits to fatigue-related risk for drivers that can last 1-2 hours. However, this can vary between people due to differences in tolerances and fatigue levels. It is recommended to use caffeine judiciously, in smaller doses (less than 150 – 200 mg), rather than large single doses, and keeping it for when the initial signs of fatigue are detected. The combination of a short nap (20 – 30 minutes) with caffeine (150 – 200mg, or the equivalent of two cups of coffee) has been shown to have the most beneficial effect for increasing alertness and improving performance up to a few hours. Sleep experts and the National Sleep Foundation recommend taking caffeine just before a short nap in order to get the benefit from both countermeasures. The caffeine will take 15 – 30 minutes to enter the bloodstream, during which time an operator has an opportunity to sleep. Upon waking, the operator will have the alerting benefits of sleep and the additional benefits of the caffeine. Strategies such as rolling down the window, cold air to face, turning up the radio/stereo, chewing gum or talking to someone, have been shown to have only marginal benefits for a short time (less than about 15 minutes). 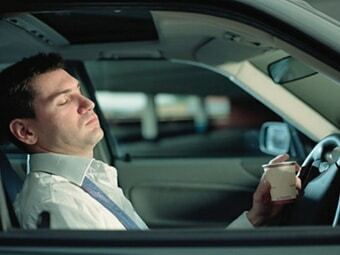 These techniques should not be used to prolong driving, but may provide sufficient time for a driver to locate a suitable place to stop and apply more effective countermeasures such as napping and/or intake of caffeine. Technology that can objectively detect the first signs of fatigue can be used to effectively complement organisational and regulatory approaches by informing drivers and their supervisors the optimal time at which to apply appropriate countermeasures. The continuous real-time feedback of fatigue levels provided by Optalert technology, combined with in-cab warnings assists drivers and their supervisors to more effectively manage fatigue risks. The objective data is visible to both driver and supervisor in real-time. This information can be used positively as a tool for operational decisions such as recommending breaks and appropriate fatigue countermeasures. The combination of Optalert technology with fatigue countermeasures creates tailored defences for companies to effectively manage fatigue risks.